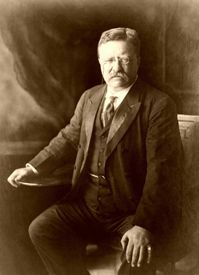 Theodore Roosevelt, the 26th President of the United States, was born in New York City, New York on October 27, 1858. He was descended from an old Dutch family that came from Holland in 1644 and settled in New Amsterdam, which New York City was then called. 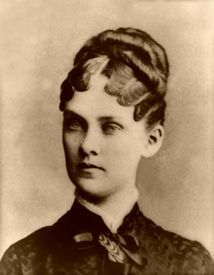 His father, Theodore Roosevelt, was a glass merchant, a figure in city affairs, a philanthropist widely respected and beloved; his mother, Martha Bulloch, was a woman of unusual beauty and charm, of cool good sense and passionate devotions. Theodore was, from his birth, a frail boy, who suffered much from asthma and other bodily ailments. For weeks on end he was forced to keep to his bed, and the rough-and-tumble of boyhood was during his early years altogether withheld from him. He learned to read while he was still in skirts, and before he was out of the nursery age, books had become companions to him and comforters in pain. His sisters, his brother and their friends were his devoted followers, who found the stories he told them, hour after hour, altogether thrilling. He went to school for a brief period at Professor McMullen’s Academy, near Madison Square, but his health permitted him no regular schooling, and tutors and governesses gave him an uneven elementary education, which he extended and deepened by wide reading of heroic tales and natural history, of science and biography. When he was nine, he was taken through Europe, but, to judge from the journal he kept, gained nothing from it except a small boy’s spread-eagle homesickness for his own land. Another trip to Europe four years later opened his eyes. He had, by that time, become an ardent naturalist, and Egypt and the Continent were interesting for their birds, if not for their monuments. He spent a winter in a German family in Dresden and returned to America with an understanding of foreign lands which served to give him a real appreciation of his own. Still handicapped by his physical frailness, he prepared himself for college. Meanwhile, he had acquired certain ideals of life and conduct which exercised a deep influence on his character. He was a notable hero-worshipper, with his father as his greatest hero then as always, and behind him, the company of the heroic dead, who had become familiar to him through books. He measured himself by them, found himself wanting both in courage and physical strength, and doggedly set to work to repair the defects. He took boxing lessons, and exercised with a persistence that did not abate, in the gymnasium his father installed for him. The world of outdoors was a source of delight and adventure. His boy’s love for birds and insects developed into the scientist’s ardor for solid knowledge. When he went to college in the autumn of 1876, it was with the determination to become an animal naturalist. His years at Harvard were years of growth and joyous companionship. He studied hard, he read widely and deeply, he plunged into a dozen different undergraduate activities, from boxing and fencing and football, to acting and writing, Sunday-school teaching, and discussion of art. He romped one day, he wrote history the next; he made many friends; he gained a few devoted followers who prophesied great things for him; meanwhile, he grew in body and mind. He graduated in June, 1880. Shortly afterwards, he married Alice Lee of Chestnut Hill, who had been the radiant center of the group of boys and girls with whom he had “run” during his Harvard years. They went to Europe, where Theodore Roosevelt climbed the Matterhorn for no particular reason except that a pair of Englishmen with whom he had talked seemed to think that they were the only ones who had ever climbed it or ever would; and returned to America, more ardently American than ever, and settled in New York. He had long given up his intention of becoming a naturalist, without, however, being able to decide what he would become. With no great enthusiasm for the law, he entered the Columbia Law School and, at the same time, the law office of his uncle, Robert Roosevelt. In the meantime, he completed a book entitled The Naval War of 1812, which he had begun in college, looked about in the political world of his native city, and joined the Republican Club of the Twenty-first Assembly District. He became a factor, if not a power, there at once, and on the initiative of a shrewd, keen-witted Irishman named “Joe” Murray, a local “boss,” was nominated for the Assembly within a year, and elected. In Albany, he sprang almost at once into leadership. Before his first term was over he was a national figure, at the end of his third he was a force to be reckoned with in the Republican Party, head of his State delegation to the National Convention, the hero of young men, the hope of all who were working for the triumph of the better elements in American politics. He gained his first fame through a fearless attack on a corrupt judge whom the leaders of his own party were seeking to shelter; but, the real confidence of the public, he won by solid and persistent work against odds for honest government and progressive legislation. Alice Lee Roosevelt, Theodore Roosevelt’s first wife. A personal catastrophe cut off completely and, it seemed forever, his political career. In February, 1884, his mother died suddenly. The same night, his daughter was born, and twelve hours later his wife died. He finished his term in the Assembly, did what he could to nominate the man of his choice at the Republican Convention in Chicago, failed, and hid himself, disheartened, on a ranch he had purchased the preceding autumn on the banks of the Little Missouri River in North Dakota. In the two years or more that followed, the gay world of New York City, and that other complex and tumultuous world of politics through which he had passed like a cyclone, saw Theodore Roosevelt only for hurried glimpses, if at all. He had altogether resigned whatever political ambitions he might have had. He wanted to write; and he did write an entertaining book of hunter’s tales, a fresh and authoritative biography of Thomas H. Benton, another of Gouverneur Morris, a volume concerning ranch-life; but, these were incidental. He had bought a great herd of cattle, he had called to his side from Maine a pair of old friends and stalwart backwoodsmen named Bill Sewall and Wilmot Dow; with them he had built a house which he called Elkhorn; and he was now a ranchman whose life was bounded by the circle of cares and wholesome hardships and pleasures and perils that make up a ranchman’s days. 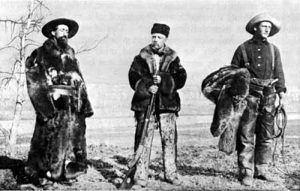 Wilmot Dow, Theodore Roosevelt and Bill Sewall at the Elkhorn Ranch in North Dakota. The bleak and savage country and the primitive conditions of life fascinated his imagination; the hardy men who were his companions gripped his affections and held them. The “women-folk” in Maine joined their husbands and took charge of Elkhorn, and for two years made a home where the days passed in a round of manly endeavor and simple-hearted fellowship that in the memory of all who were a part of it lingered as a kind of pastoral idyll. Working on the round-up, riding for days on end after stray cattle, hunting over the bare prairies and up the ragged peaks, Theodore Roosevelt won at last the strength of body he had set out to gain 15 years before. He won much else as well — an understanding of the common man and of the West, a deeper appreciation of the meaning of democracy, a revived interest in life. His career as a ranchman came to an end in the autumn of 1886, when he went East to accept the Republican nomination for Mayor of New York City. In the mayoral contest, he was defeated by Abram S. Hewitt, the Democratic candidate. That same year, he married Edith Kermit Carow, and the couple would have five children, in addition to his daughter by his first wife. In 1889, he was appointed to the United States Civil Service Commission by President Benjamin Harrison and was retained in that position by President Grover Cleveland. He resigned in 1895 to become president of the police board of New York City, and by his reorganization of the department in the interests of honesty and efficiency, he won national fame.